Propane Uses for Recreational Property and Cabins - Welcome to NIHO Land & Cattle Company Ltd. Many of the recreational properties in BC are too far away from power lines for electricity. While we’ve discussed solar power elsewhere, another solution we champion over noisy and polluting gas generators are appliances which run on propane. Yes, the same bottles which hook up to your camping stoves and lanterns also provides you with a cheaper alternative to gas generators and solar power modules. It is said that propane solutions offer more efficiency, less appliance maintenance, and more convenience than either electricity or fuel oil. Since all pollutants are removed before it enters the pipeline, a propane solution is more environmentally friendly than fuel generators. While gas appliances may cost more in the short term, due to the high efficiency of propane, these appliances will use less energy than their electric or fuel run counterparts. All propane appliances in Canada are built to meet the Canadian Gas Association, and the CGA seal of certification should appear on all propane appliances. 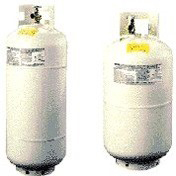 There are a couple of issues to consider when choosing a propane solution. The first is how much propane do you require? Propane tanks come in all sizes. You can get little tanks which you can refill, or you can go for the larger cylinders. You can get a Typically, a 500 gallon tank is enough for a four bedroom home. The second is where will the tanks of propane go? With the exception of certain small legally permissible types, propane tanks must be installed outside of buildings. Finally, you must consider venting issues. Most propane appliances will need to have outdoor venting to meet with national safety codes. Check with your local contractor for the best solution for you. Propane heating and electrical systems have increased in leaps and bounds over the last several years. Propane can run electrical generators through a process called “cogeneration”, in which propane is used to heat water in a steam boiler. The steam that is produced by this flows through a turbine to turn blades attached to a shaft extending into an electric generator. As the shaft spins, electricity is produced in the generator. Gas heat pumps can provide hot air to the house through a propane gas engine. A gas heat pump's engine design life exceeds 40,000 hours, significantly longer than an electric heat pump. Cooking appliances. This is probably the most familiar of the propane appliances, as we are all familiar with the camp stove or other burners when backpacking. But propane can be used for larger ovens, ranges, and cook tops. Refrigerators. Exactly the same as your normal fridge, except that it will need to vent outdoors or be equipped with a carbon monoxide detector which shuts off the propane burner should carbon monoxide become present. Clothes Dryers. Propane clothes dryers currently cannot be told apart from their electrical counterparts. They have the same settings for all your fabric needs, and time sensors with automatic shut-offs. One major feature is that a propane gas clothes dryer can complete the same load as an electric dryer in ¾ of the time. Water Heaters. There are two types of propane water heaters. Storage Water Heaters hold heated water in a controlled storage tank. They can produce up to four times as much hot water as electric models during the same amount of time. Instantaneous, Tank-less Water Heaters is when a gas burner automatically ignites when a hot water tap is turned on, and shuts off when the tap is turned off. These models are ideal for limited spaces. Since these units do not continually heat water in a storage tank, you will save money over the long run. Outdoor Uses. Propane barbeques are a common sight, but there are also propane gas lights, which can come with timers to activate in the dark. There are also propane space heaters to warm up your porch or patio in the cooler months. There are even propane solutions for heated pools, hot tubs and spas. Propane is a wonderful solution for a recreational property. Cheaper, more environmentally friendly and more efficient than fuel oil, propane offers more bang for your buck when you are looking at power and heating solutions for your property.